If you’ve ever modified precompiled applications, you have undoubtedly spent time with XDA Recognized Developer Brut.all‘s APKTool or one of its variants. APKTool works quite well, which is why after so many years, people still use it. However, using APKTool then requires you to use a separate app such as Notepad++ to edit the decompiled binaries. Once that’s done, you then have to go back to APKTool to recompile the modified app. In order to streamline things significantly, XDA Forum Member vaibhavpandeylive created APK Studio. Perhaps the best way to classify APK Studio would be to call it an IDE for .smali files, complete with syntax highlighting. But rather than simply allow you to edit and visualize the code, APK Studio also is able to decompile and recompile binaries from within the utility itself. 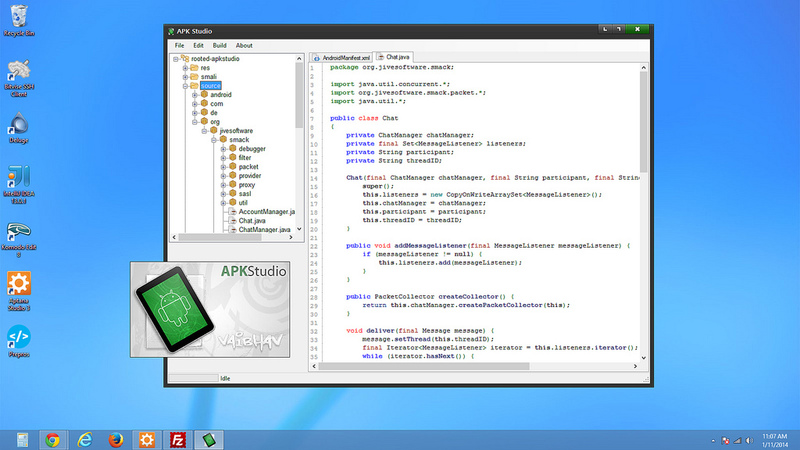 Thus, it leads to a much more streamlined APK editing process, since now you only need one tool to do everything. While ideally source-built development and app modification is the way to go, there are many times in which an app’s source code is not available, but you still wish to make a few tweaks for personal use. For situations like these, APK Studio will certainly come in handy. Head over to the utility thread to give it a shot. And if you think you can improve upon the app, download the app’s source code and have a go at it.